Traveling the distance in comfort, and passing gas stations by, the all- Toyota Prius c is here and ready to take you wherever you want to go! At Charlottetown Toyota in Charlottetown, PEI, we stock all of the latest in Toyota's new line of versatile vehicles, including the 2016 Toyota Prius c! We enjoy making your dreams come to life and helping find the best fit for you and whatever journeys may lie ahead. Year in and year out, our award winning staff and establishment is honored to continue to serve the Prince Edward Island area. Ready to stop on in and take a test drive? We're prepared to make it happen for you today! Stop on into our location at 1 Superior Crescent Charlottetown, PEI, and let's make your dreams a reality! The all- Toyota Prius c is topping the charts as one of the most fuel-efficient vehicles in its class. With its Hybrid Synergy Drive System working in conjunction with the Hybrid (Gas/Electric) Engine, you will be clocking in at an EPA-Estimated 4.5 L/100km, and 5.1 L/100km city. That's fuel efficiency that will keep your wallets fuller! With the ability to switch between different driving modes, you can set it to the mode or style that fits your needs the best, whenever you want! The ECO Mode is set up to help you get the most out of your fuel tank, and limit unnecessary use of fuel while the EV Mode allows you to travel short distances on purely battery power alone! Rated as a Super Ultra Low Emission Vehicle, you can feel confident that you are minimizing your emissions, and helping to keep a cleaner environment. The Prius c keeps you outfitted with the devices that you need to monitor your fuel efficiency effectively, and get the most out of your miles. The Multi-Information Display provides a range of information, including fuel economy, cruising range, EV driving distance, trip timer, and outside temperature. Furthermore, the Energy Monitor assists by showing when, and how, your car uses energy; used in conjunction with the Hybrid Synergy Drive, you can feel confident that your Prius c is always working at optimum functionality, and minimizing your fuel use. If you're curious to see how your driving is affecting your stats, check out the ECO Score Display, which will rate you in three categories - stopping, cruising, and starting - and provides a score that is based on your performance. Backed by Toyota's ambitiously innovative and safety-pioneering development team, the all- Toyota Prius c utilizes cutting-edge safety systems and intricate design, made to keep you and your passengers safe while you're on the road. Toyota's Safety Sense C package comes with a multitude of safety systems including: Lane Departure Alert, Auto High Beams, and Pre-Collision System. The Star Safety System combines Vehicle Stability Control, Traction Control, Electronic Brake-force Distribution, Brake Assist, Anti-lock Brake System, and Smart Stop Technology, to give your vehicle a superior defensive edge over the hazards of the road. In the case of an incident, the Prius c is equipped with nine airbags and designed with Crumple Zones, that are made to mitigate and more equally displace force that occurs during a collision. 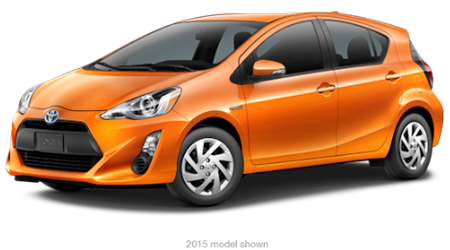 Now you know about one the coolest, most efficient, and versatile vehicles on the road, the all- Toyota Prius c! Are you travel farther than you ever have, and all while having more fun than you thought possible? We're ready to serve you today! Located at 1 Superior Crescent Charlottetown, PEI, we're just a hop, skip, and a jump away… so what are you waiting for? Come by and let's make your dreams come true!